Murname is an optical physicist with the University of Colorado, and makes lasers that flash like a strobe light, but faster than any that you'd find at a party. Murname's lasers flash once every ten quadrillionths of a second. Her lasers were designed to act like camera flashes, to help scientists record fast motions, like those found in chemical reactions. After earning her doctorate, Murnane and her husband, Henry Kapteyn, worked at Washington State University and also the University of Michigan. Living in Colorado has provided Murnane and Kapteyn the opportunities to ski and hike the Rockies. The two also enjoy traveling the world. Margaret Murnane grew up in Ireland. Her father was an elementary school teacher who encouraged her love of math and science with puzzles and chocolate reward for a job well done. 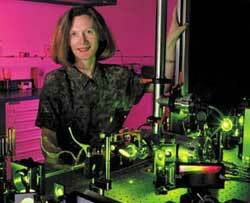 Murnane took physics in high school and loved it, despite it being her worst subject. She went on to earn her Bachelors and Masters in physics from University College Cork, and then moved to the United States to study at the University of California in Berkley. While studying there, she met and fell in love with Henry Kapteyn, and American physics grad student. The two are married and run a lab together.